Besides your teeth, your gums are equally important for a healthy, beautiful smile. The biggest threat to their health involves a preventable infection called periodontal (gum) disease. Although it can be avoided, 50% to 80% of adults have a form of the infection. To save your smile before irreversible damage occurs, you need gum disease treatment in Arlington Heights. Costello Dental has the individualized solutions you need to restore your oral health. 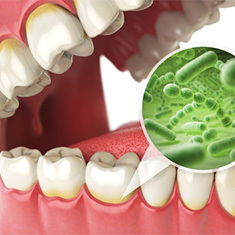 Gum disease is an infection that develops in the tissue from bacteria found in plaque and tartar accumulations. In its earliest stage, known as gingivitis, it causes inflammation, redness, and bleeding. At this point, it can be treated quickly without causing long-term complications. Unfortunately, many people fail to recognize the early signs of it. This causes it to progress in severity. Deep pockets form in the tissue, trapping additional bacteria. Over time, it destroys the supporting structures of your teeth. Ultimately, it can lead to tooth loss. The bacteria can also enter your bloodstream, causing serious health concerns, like cardiovascular disease, Alzheimer’s disease, and diabetic complications. Your dentist in Arlington Heights, Dr. Ernie, evaluates your oral health to create individualized solutions to stop the infection. Depending on your needs, you may require one or both therapies. Scaling and root planing are more commonly known as a deep cleaning. Your dentist uses special tools to remove plaque and tartar from before the gum line. The pockets are thoroughly cleaned before root planing begins. This involves smoothing the roots of your teeth. By doing so, it helps your gum tissue reattach to your teeth to seal out bacteria to prevent future buildup. Antibiotic therapy kills the harmful bacteria. Dr. Ernie prescribes an antibiotic to take according to his recommendations to restore the health of your smile. To prevent future infection, Dr. Ernie discusses your current oral hygiene routine and makes recommendations for improvement. It is best to brush your teeth at least twice a day for 2 minutes each session. Use a soft-bristled toothbrush and tartar-control toothpaste to clean all surfaces of your teeth. To clean areas that were missed by your toothbrush, do not forget to floss every night before going to bed. Choose a high-quality floss supported by the American Dental Association. Dr. Ernie may also recommend the use of an antimicrobial or antibacterial mouthrinse to reduce harmful bacteria in your mouth. You will need more frequent cleanings and checkups until the health of your smile is restored. 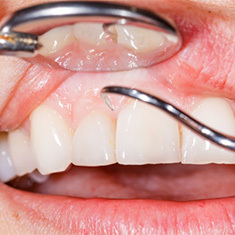 On average, you can expect to schedule an appointment about every 3 to 4 months for periodontal maintenance cleanings. Do not place the health of your mouth or body at risk. 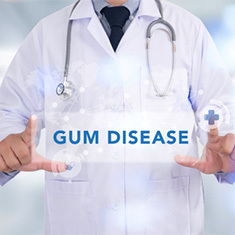 Get the treatment you need for gum disease. With a proactive approach, we can save your smile by stopping the infection in its tracks. Contact our office today to schedule your consultation for periodontal therapy.